The Nazis, newly in power and early simmering with racist hatred for all things un-German, didn’t know what to make of the shining white city on the hill. So utterly alien to the fascists was the blinding bright geometry of the houses and apartment buildings that they could only cast about to find the most insulting comparison possible–something not European, something “primitive,” something like an “Arab village.” Driven by their overriding desire for Teutonic authenticity, the political party that left no occasion to ridicule modernism unmarked, distributed a postcard of the new architecture. Sponsored by the Deutscher Werkbund, the Weissenhof, a showcase for the efforts and talents of Europe’s most advanced builders was ridiculed in a deliberately misreading of the simplicity, characterizing clarity as ignorance. 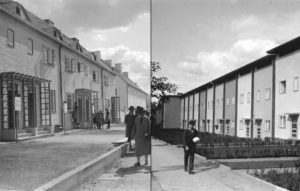 The project, headed by architect Mies van der Rohe (1886-1969), was marked as undesirable and the Nazis would not forget the affront of the Weissenhof settlement. 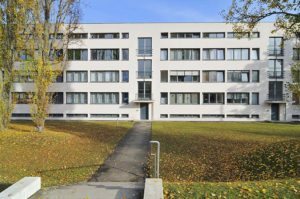 They had to wait only a few years for the pleasure of closing the Bauhaus, headed by Mies by 1933 and had plans for the Weissenhof which they purchased. Revenge was sweet but brief for the Nazis. Considered a significant landmark in Modernist architecture, the project in Stuttgart was subjected to numerous indignities under the regime of Adolf Hitler. Towards the end of the Second World War, the Weissenhof was partially destroyed during the Second World War. Today, the site is considered a World Heritage, its buildings are being slowly restored, the vision of their creators shining through and beyond the dark memories of Nazi projects. It is saying a great deal to note that the functionalist moment for Nazi architecture–its high point of innovation–was the concentration camp, the built environment that was an assembly line of industrial murder, while the Weissenhof was a more modest achievement, an experiment in building modern housing for middle and lower class people. Mies van der Rohe had experienced enough architectural success to realize that in order to transcend his humble beginnings from a working class family, he had to change his name. His new appellation had to be more suited to his elevated status. 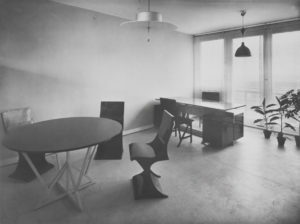 His real name was Maria Ludwig Michael Mies, a perfectly sensible designation, but avant-garde artists, such as Le Corbusier, often changed their names or gave themselves specific designations, so the stonemason’s son began to reinvent himself. Taking his mother’s last name, Rohe as his last name, he switched his original last name to his first name, Mies, giving the “e” an umlaut: ë, so the word would be pronounced “mee-ess.” The “van” and the “der” was pure Dutch and suggested some kind of vague nobility, reminiscent of the German “von,” adding an air of international distinction. And thus “Mies,” as he was commonly known, was born, as new as the architecture he designed. By the Twenties, Mies was a chancer, a comer in architectural circles, well known in Europe and in Germany. He was part of every significant organization in modern architecture, from the Deutscher Werkbund to the group of ten Berlin architects, known as The Ring, all dedicated to the promotion of the tenets of New Objectivity to architecture. The program, such as it was, for Neues Bauen was relatively simple–functionalism and straightforward matter of fact forms, determined by construction methods and technological advances. Hovering behind the scenes, off stage, was Adolf Loos (1870-1933) of Vienna, whose book, Ornament and Crime (1910), provided the manifesto for New Architecture, which would be stripped of ornament and decoration, and emphasize the unadorned “surface” of a geometrically formed block-like structure. But the road to Modernism was not as straightforward as the design itself. Sharp observers will notice something strange about the attractive residences lining Am Fischtal, a bucolic street in the Zehlendorf section of Berlin. On one side, the buildings have flat roofs, while on the other they are pitched: a situation that is less architectural happenstance than the result of a so-called “roof war,” waged in the Weimar Republic and which embodied many of the deeper conflicts that roiled Germany in the years before the Nazis came to power..The two sides met on Am Fischtal, which today survives as a literal and figurative monument to the Weimar Republic’s increasing political divide. The flat roof residences came first, part of a housing development built by a leftist housing cooperative between 1926 and 1932 known as Onkel Toms Hütte, or Uncle Tom’s Cabin, an unlikely moniker borrowed from a nearby tavern which was named after the Harriet Beecher Stowe novel. 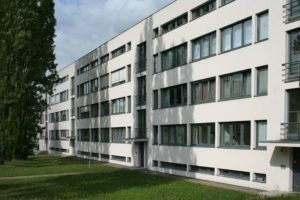 Across the street, GAGFAH, a housing cooperative supported by conservative white collar unions, built their response in 1928: a community called Fischtalgrund, which consists of 30 buildings with 120 housing units. The roofs, of course, were pitched. 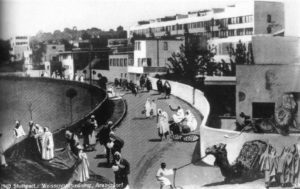 The Roof War roiled Berlin for four years, from 1924 when architect Bruno Taut, part of The Ring group, was hired and designed flat roofs, to the completion of the dueling dwellings in 1928. Today the rows of contending houses face each other across the street, co-existing in the peace of history. At the time, however, feelings ran too high to attribute the emotions of the opponents to their attitudes towards roofs–the roof was politicized and its slant or lack thereof symbolized a power struggle between left and right. But in the mid-1920s, the forces of the pitched roofs seemed to be fighting a rear-guard battle. Modern architecture appeared to be not just the style of the present but the approach that would also mold the future. The financial situation of the Weimar Republic was at last on a firm footing, America had come through with some aid thanks to the Dawes Plan, and municipalities, convinced of the need to build new urban housing for a new world, now had to means and the will to follow through. Enter Neues Bauen. 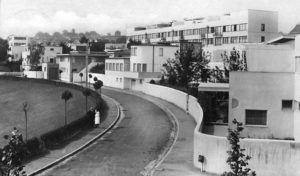 At last, the new Germany could be built and, in 1927, with the most famous of the inter-war experiments, the city of Stuttgart would be crowned by the “village” (siedlung) of white buildings (weissenhof). The Weissenhofsiedlung was more than a village, it was an exhibition, a showcase for new building techniques, new technological advances in structure, and a strong statement about how people could live in a modern world. Presiding over the Weissenhofsiedlung, Mies van der Rohe, who would later become the last head of the Bauhaus, was the vice-president of the sponsoring agent, the Deutscher Werkbund. Mies was the obvious choice to head the project. The proposed site was the top of a hill overlooking the city where a group of buildings would rise on a curved plateau according to the master plan configured by the director. Offending local architects of the somewhat provincial city, Mies appointed sixteen other architects, all modernists, true, but within that designation, he selected architects more or less purist about the rigors of modernism, with a span of generations. To his credit, Mies allowed each architect to design with freedom, stating, “In order to permit each one as much freedom as possible to execute his ideas, I have set neither guidelines nor given programmatic orientation,” as long as his rules of flat roofs and white as the color of all the buildings and, of course, no ornamentation, were followed. He also determined where each building would be sited, giving himself the place of pride–dead center and at the top of the hill–for his own apartment block. As a generous gesture, Mies gave the French architect Le Corbusier (1887-1965) first choice as to where his house would be placed. In his 2002 article, “Re-covering Mies van der Rohe’s Weissenhof: The Ultimate Surface,” Mark Stankard noted that the architect designed according to the the concept of “rationality” and standardization that led to typification. 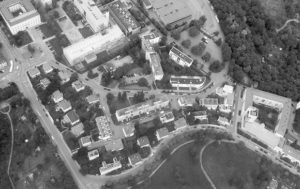 Like all modernist architects of the period, the artists of the Weissenhof thought in terms of mass housing, where personal statements and non-rational shapes would be inappropriate for prefabricated and predetermined building materials. As Stankard pointed out, while Mies posited the need for Typisierung (the formation of a repeatable type), he allowed for “freedom of usage.” As he said in 1926, “The exterior shell of things, the crystallization of life processes remains standing..and exerts its influence long after its kernel has been hollowed out.” The distinction between inside and outside, the domestic and private and the public and exterior facing aspect of a building was one that Loos had written about at some length. The public face of the modernist building was a series of sharp-edged blocks, free of decoration, painted while and undisturbed by errant roofs, but the interior of these shells, the space Loos considered to be “female,” could be personalized by the owner. In his apartment block, Mies adopted another practice of Loos: the notion of the back of the home as facing a private garden, contrasting nature–private, facing inward–to culture–the unrelenting white wall, rising as a barrier, protecting the owners from the eyes on the street. The inversion of the Weissenhof, in all its innovation, was, in its time, a prime example of the “shock of the new,” a term popularized by art critic, Robert Hughes. The Great War had interrupted the development of modern architecture, which had been well underway before 1914. The idea of Machine Age architecture, or functionalism, was a credo that can be dated from the practice of Peter Behrens (1886-1940) and his apprentices, which included Mies van der Rohe, Walter Gropius, and Le Corbusier. In his book The Master Builders: Le Corbusier, Mies Van Der Rohe, Frank Lloyd Wright, historian Peter Blake explained that with his famous AEG factory building, Behrens ushered the modern era of architecture as function. As Blake noted, “Corbu and the others were driven to utilitarianism in building, because the doors to polite architecture were closed to them..The important thing to these men was the development of a new aesthetic language, and specifically, a language that could be used to deal with the problems of today. In utilitarian buildings and products, they found the aesthetic vocabulary–cubes, spheres, cylinders, cones, and so forth.” But for the early years of the twentieth century, the architecture of the Machine was more of a dream than a reality. As Blake stated, there were only two modern buildings in Germany when the War broke out. The first and the one that is still extant is the Fagus Factory (1911) by Walter Gropius (1883-1969) and his partner, Walter Meyer, in Bonn. A factory with a curtain wall of glass, the shoe last factory, was an advance, in terms of modernity, upon Behrens’ Turbine Factory (1908). Sadly the curtain walled building Gropius designed for the Cologne exhibition of the Deutscher Werkbund was destroyed during the War, but its precedent loomed large in the architectural community. The impact of Gropius upon the German architects was enormous, destroying the lingering of the influences of the exuberant modernism of the American architect Frank Lloyd Wright (1867-1959), who was far too fond of decoration. After the War, there was a pause in building as Germany recovered, gathered its collective soul and began to move forward. The German artists now had to permission and the financial opportunity to build Machine Age architecture. To the public, unaware of the architectural dialogue which had been thriving for a decade, the Weissenhof project would have been a revelation. The city of Stuttgart, ignoring its local traditionalists, decided to take a modern direction in its Die Wohnung (The Home) Exhibition of 1927. The apartment block of Mies loomed above the works of the other architects, presiding, as it were, over the “colony,” a group of buildings he regarded as “Medieval” in its clustering. The exterior of his horizontal building was uninterrupted, and Mies kept the horizontal ribbon of windows flat to the wall, denying the entryways any emphasis that might break the purity of the line of the flat white wall. In contrast to the unforgiving obdurate exterior, the interior of the building was free and undetermined. His “freedom of usage” could exist, because he used a steel frame for the first time to construct his apartment building, filling in the frame with masonry blocks, covering all these materials with white plaster. Therefore, the steel structure carried the load, and there was no need for interior load bearing walls. Mies was able to open up the inside space and configure it as an open plan, free of obstructions. Frank Lloyd Wright was one of the first to open up living spaces, eliminating the enclosed and specialized rooms beloved by Victorians. But Wright used fixed interior partitions, with placement decided by himself alone. Sensitive to the Art Nouveau concept of the Gesamtkunstwerk, Wright designed the interior space, from stained glass windows to the furniture himself. Thinking of the blueprint as his blank canvas, Wright would often nail the chairs and tables to the floor. Mies gave up the total control of the private space and left decisions to the owners’ needs. Borrowing an idea from the Dutch Gerrit Rietveld (1888-1964), he installed movable partitions, allowing the resident to shape rooms and spaces as he or she needed. “As you know,” he said, “I intend to try out the most varied plans in this apartment house. For the time being, I am building only the outside and common walls, and inside each apartment only the two piers that support the ceiling. All the rest is to be as free as it possibly can be.” Although much of this pre-war work was still in the experimental stages, Mies had expressed a philosophy of Neues Wohnen or New Living. Because of the plumbing and wiring demands, only the bathroom and kitchen and elevators shaft were fixed on site. Although the other architects in the Weissenhof were tasked with installing furniture in their homes, Mies designed only two areas in his free plan, once again suggesting to the viewer the endless possibilities for furnishings that were personal choices. As Carsten Krohn noted, the apartment building was deceptively fragile, writing in Mies van der Rohe – The Built Work that “Without maintenance and renovation, the building would today be a ruin.” Plaster, rather than stucco, would always be a problem, white walls in a city experiencing pollution would be rarely clean, and, as was pointed out in the discussion on the homes of the Masters at the Bauhaus, the glazed walls let in cold air and the heat of the summer. During the exhibition in 1927, half a million visitors streamed into Stuttgart to see the novel housing complex. Today there is a handful of surviving buildings which have been restored and pilgrims still come and pay homage to the Weissenhofsiedlung.